...Journeying Up the Mountain of God: "Battlefield Strength"
“We will speak the truth in love, growing (deeper) in every way more and more like Christ…” (Ephesians 4:15, NLT) Seems like with each passing year, “speaking the truth in love” becomes more and more unpopular, especially to those called of God to “Preach the Word” (2 Timothy 4:2-4). For 14 years since entering vocational ministry, my heart has remained burdened over the unrepentant attitudes and apathy so prevalent today across America and throughout many of her community lighthouses (i.e. churches). The prophet Jeremiah penned similar feelings for his God-given desire to see God’s people heed the bugle cry of the watchman on the wall (Isaiah 21:6) for the approaching enemy and possibility of destruction that existed, “My heart pounds within me, I cannot keep silent. For I have heard the sound of the trumpet; I have heard the battle cry.” (Jeremiah 4:19b) In nearly every direction and on nearly every spiritual battlefield today, the enemy— Satan—seems to be scoring far too many “easy” victories…some thru brief skirmishes, most thru ground that has been surrendered with little to no resistance from God’s Soldiers of Light! Why? 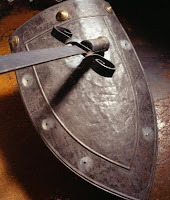 Some say because they are just too busy to fight the enemy; some say they are not ‘called’ to be out there on the battlefields; and many others simply don’t see the battlefields before them and don’t hear the battle cry which is issued for every believer to daily “Fight the Good Faith!” (1 Timothy 6:12) Yet we hear the warning from God’s Word, “You will be ever hearing but never understanding; you will be ever seeing but never perceiving. For this people's heart has become calloused; they hardly hear with their ears, and they have closed their eyes.” (Matthew 13:14-15) We are - without debate - living in “perilous times” (2 Timothy 3) which are easily affirmed by the headlines of our day. Yet it seems with each passing month, more of God’s soldiers are choosing to walk off today’s spiritual battlefields…disheartened, debilitated, distraught, and many defeated! Each day, we must obediently choose to pick up His “sword of truth” (Ephesians 6:17, Hebrews 4:12) and courageously engage the enemy who longs to destroy us and everything the reflects God’s glory in His creation (John 10:10)! In the last days before Christ returns, God’s Word tells us that “sin will be rampant everywhere, and the love of many will grow cold.” (Matthew 24:12, NLT) Every soldier of Christ today has the decision to make each new day – either to continue fighting the good fight, or to leave the battlefields thereby yielding ground/territory for the enemy to freely claim! Lest we forget – these battles which we fight are not just for us, but also for the many who remain as spiritual POW’s behind the lines in the enemy’s camp awaiting the taste of true freedom that only comes through the victory Christ has already received! (Colossians 1:13-14, Galatians 5:1, 1 Corinthians 15:57)! …Selah! Today's Spirit-led CCM video is a "classic" by Ron Kenoly and can be viewed by clicking on the song title, "Battle is the Lords" - G3 for sharing His power-filled words thru CCM & Praise!